The harvest of the picual olive fruit in Sierra de Segura (Jaén, Spain) starts in the first days of November and finishes at the end of January or February, this last date depends on the harvest-time productivity. But it is in November and December when the harvested olives reach the highest quality which results are the certified extra virgin olive oils. The Regulatory Council marks the optimum moment of ripeness, when the olive is changing its colour. This situation is called envero. In that moment, the olive oil is formed and it usually coincides with the second or third week of November. The harvest is done by shaking the branches with pneumatic branch shakers or the trunk with mechanical tree shakers. For obtaining olive oils which reach the quality in order to be certified as DO Sierra de Segura, it is basic that the tree olive is separated from the ground olive using canvases that are put under the tree. Tree olives must be always separated from ground olives, transport included. 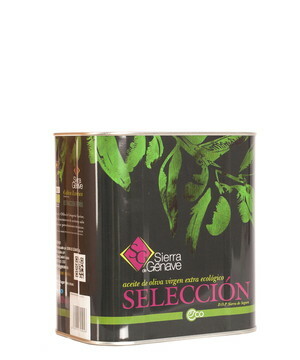 Just the tree olive is selected for extracting the olive oil DO Sierra de Segura. The transport of the fruit to the olive oil mill is done in bulk and with care, in vehicles with trailer and in the same day of the harvest. When the olives arrive to the mill, they are cleaned with air for separating leaves and little branches. After that, the olives can be washing with running water or not, but it is better not to wash the olives. Finally, clean olives are weighed and transported to storage hoppers. Nowadays, the extraction of virgin olive oil is made by centrifugation. The traditional system was by pressure, in which the ground paste from squeezed olives was whipped and spread in round mats for pressing them with hydraulic presses. This system has fall into disuse in this region because it needs more workers and the capacity of producing high quality olive oils is inferior to the two-phase system. In a modern mill, the ground paste whipped is centrifuged in a horizontal centrifuge to separate the olive oil and the olive pomace. After that, the olive oil is centrifuged again in a vertical centrifuge, where the oil is separated from the vegetable water, and, finally, it is sent to decanting and storage tanks. The cellars of the olive oil mills / bottling companies must be large enough to permit the separation of qualities. The olive oil which comes from ground olives must be separated from those ones which come from tree olives and which have not touched the ground. The olive oils of the beginning of the harvest-time, which are more fruity and with greener colours, must be completely separated from those oils of the end of the harvest-time, which have plainer flavours and their colour are more golden. On the other hand, tanks must be of stainless steel and with a conical or sloping base in order to make easier the drained of water and the withdrawal of impurities (olive pulp remains). 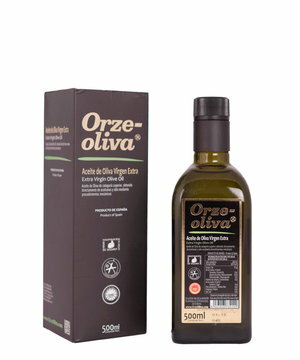 Besides, the maintenance of a stable temperature (around 20º C) is another important factor for storing the olive oil. As well as the controls on the elaboration process which are carried out during the harvest-time, it is also vital the “tank by tank” control which is made by the Regulatory Council to guarantee the quality of each batch of olive oil. The Regulatory Council analyses all the cellar of the olive oil mills inscribed in this Agency. The samples, which are been taken by a technician of the Regulatory Council with the aim of certifying the origin of the sample, are sent to the laboratory for their physical-chemical analysis (acidity, peroxides and K270) and organoleptic analysis. If the parameters obtained match those of extra virgin olive oil and it is proved the absence of chemical residues of phytosanitary origin in the tank with a multiresidue analysis, the certification of these samples is made. 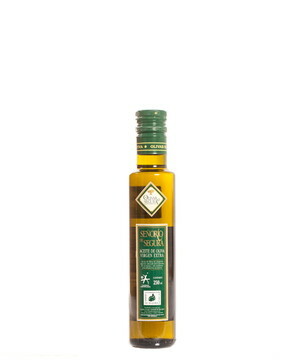 According to this quality process, the Regulatory Council guarantees the origin of the olive oil, (Designation of Origin Sierra de Segura), its quality (extra virgin olive oil) and the absence of chemical products in all the batches of olive oil bottled with the label of this Designation of Origin. Although the separation of the olive oil from the rest of the olive components is made in different stages of the elaboration process, it is necessary to make one more separation to eliminate the last possible impurities. This operation is called filtering or filtration and is carried out by filtering the olive oil through a filter material (usually diatomaceous earths.) It is an expensive process because of the lost of olive oil, but it is very beneficial since all the impurities that may ferment in the container and produce undesirable flavours and smells are eliminated. After being filtering, the olive oil certified by the Regulatory Council is sent to tanks where the olive oil is bottled depending on the market needs. For doing that, all the olive oil mills and bottling companies inscribed in th Regulatory Council have a very automated installations which favour the speed and efficiency of the filled and closed of the bottles avoiding the excessive handled and aeration of the olive oil. The Regulatory Council has control instruments for guaranteeing the traceability of the extra-virgin olive oil DO Sierra de Segura. One of these instruments is the numbered back-label, which is made specially by the Real Fábrica de Moneda y Timbre (the organisation responsible for producing Spanish banknotes and stamps) and which has three security measures. The back-labels are distributed by the Regulatory Council to check the quantity of olive oil used by each company, so they cannot exceed the certified quantity they have. Another mechanism is the pressure detectors which are installed in the tanks. They calculate periodically the volume of olive oil and this information is sent on-line to the Regulatory Council. With this measure, they will know the movements of the certified olive oils and when olive oil DO Sierra de Segura is being bottled. This knowledge favours and optimises the inspection activity of the Regulatory Council.